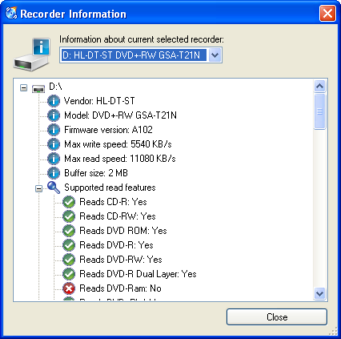 CDBurnerXP is a complete and easy to use burning application that able to burn CDs, DVDs, Blu-Ray and HD-DVDs. It also includes the feature to burn and create ISOs, as well as a multilanguage interface. This application is offer free to everyone includes companies and its does not includes adware or similar malicious components. Copy audio and data CD’s on the fly. Saves and burns ISO files- Convert .BIN and .NRG images to ISO format. Burn Audio CDs- with or without gaps. Supports MP3,WAV, OGG, WMA and FLAC files. Support for new media formats- double layer DVDs, Blu-Ray and HD-DVDs. Verifies data after burning- can simulate burning for error detection. Dropbox – drag and drop files. Other features- simple cover printing, lightScribe integration, command line version, supports most IDE,USB, Firewire and SCSI drives, online update and etc.